On April 24th at Lincoln Hall in Chicago, improvisational prog-rock jamming sextet Umphrey’s McGee hosted the first ever UMBowl, a four-quarter interactive concert experiment where the fans determined the song selection via real-time texted set lists and pre-show balloting. This post is a Live Fix exclusive enhanced version of the UMBowl concert review I wrote for Blogcritics. In it you’ll discover how Umphrey’s McGee triumphantly pushed the boundaries of interactivity during their live show by letting the fans test their musical mashup capabilities — and somehow successfully mixed Tool with The Jackson Five ( live video below) and pulled off other oddly entertaining artists mashups on the fly. We’ll also learn what a ChiCo fan is and how the night spurred the band on toward the recording of their next album. Like they did with their “S2” events last fall, the Chicago-based Umphrey’s McGee set out to push the limits of live concert interaction and redefine what it means to connect with fans by giving them more control of the music during the concert. Besides the music, one of the main tools Umphrey’s McGee used to do this was “Mozes,” a text message moderation system used during UMBowl that filtered and displayed fan’s text messages in real-time and then displayed them on a large onstage projection screen. UMBowl seemed like a tall order that required the technology, the fans and the band to all work together seamlessly for it to be a success. But it was the very nature of Umphrey’s McGee’s unpredictable, propulsive and deft jam-style playing that successfully melded all those three together and made this show simultaneously feel like an intimate engagement and a big game sporting event. Throughout the night, fans called all sorts of “musical audibles” — a mixture of favorite tracks and strange song mashups — and then watched in awe as the band answered the challenge showcasing their ability to blend unlikely musical genres and change tempo, beat and rhythm on a dime. And it was just as exciting to watch fans test the band’s musical knowledge and live improving skills as it was to see the band step up and meet the challenge of the fan’s real-time text requests. 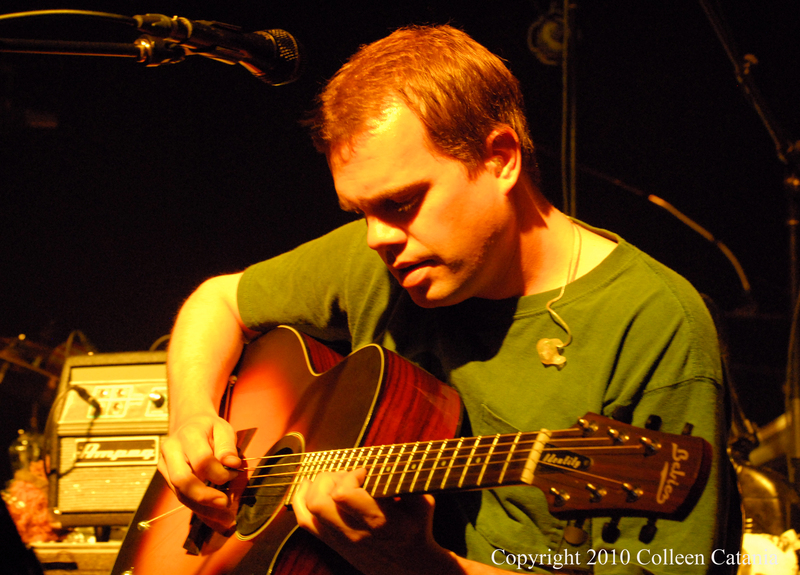 Since forming in 1997, Umphrey’s McGee has released 11 albums, a combination of studio and live recordings, with the most recent being 2009’s Mantis. I got my first taste of their dynamic live mix of jazz improv, prog rock, country, and bluegrass at Summer Camp Festival in 2008. I marveled at their fluidity and cohesiveness of the band members on stage. The balance of intensity and playfulness with which Brendan Bayliss (guitars/vocals), Jake Cinninger (guitar/vocals) and the others moved through their set was impressive at Summer Camp. And from the start of the First Quarter of UMBowl it was clear that they had elevated their live show like a veteran football team rises to the occasion when the fate of the UMBowl was on the line. Start to finish, the venue rocked with the feverish energy of a football stadium at playoff time. Some fans danced and grooved while others, who wore UMBowl football jersey-styled t-shirts, blew referee whistles to keep the band in check should they commit a sonic penalty, of which there were very few. Kicking off the first set was a tongue-in-cheek video that added humor and a big game feel to the night. 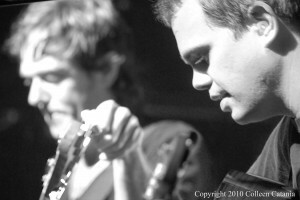 It featured all the band members talking about how playing live “is just like playing in a prime time football game.” Shortly after, all the band members strolled on stage and then started jamming their way through “Quarter One,” an acoustic set of songs entirely chosen in advance by fans who bought tickets and received ballots to cast their votes for songs. And fans truly had their way as the band unfolded re-energized versions of staple Umphrey’s McGee tracks “Front Porch” and “Divisions.” Both songs and the entire set were nearly flawless and resonated through the supreme acoustics of Lincoln Hall. In between Quarter One and Two, I saw several fans wearing t-shirts that said “ChiCo” on them. I was super curious to know more, so I asked Ryan who’s a member of ChiCo. He told me the story behind the t-shirts and explained that ChiCo is a combination of Chicago and Colorado and that the concert fan group originally formed in 2007 when the founding member met at Caribbean Holidaze in Jamaica. Over 40 ChiCo members where at UMBowl and Ryan even gave me a ChiCo business card that tells their story and directs you to their Facebook page. Then during Quarter Two the band embarked on “a wholly improvised performance driven by bi-directional texting, that was sifted and delivered by “offensive coordinator/sound caresser” Kevin Browning who did a fine job using “Mozes” to curate a hilarious and challenging series of fan-texted requests that the band nimbly and deftly navigated through. This set was also broken down further in to mini-segments where the band provided minimal direction by telling fans what type of requests to make. For example, keyboardist Joel Cummins told fans that the first segment was “mashup anything” and encouraged fans to text strange song combinations of their choice. One of my favorites during Quarter Two was the blending of Umphrey’s McGee “Cemetery Walk” with Snoop Dogg’s “Gin and Juice,” which the band nailed. Marching down the field they rolled through Quarter Three, an all-request set with songs again determined by pre-balloting from the audience members. But this quarter, like Quarter Four, had its own twist because the fans voted not just on song selection but they could determine how those songs are arranged and, in essence, create new songs during the live show. This set didn’t go as smooth or wasn’t as fun as it was to see the band work their way through the show’s improving peak during Quarter Two. But that didn’t stop me from shaking my head in amazement and or stop me from getting excited about the future possibilities of seeing other bands do something as challenging, fan-centric and courageous as UMBowl. Without a doubt, UMBowl was another innovative step forward for Umphrey’s McGee’s live show and redefined what a jam-band really is or could be. It was an event that pushed the boundaries of the concertgoing experience for fans, too. And what I like the most about the feel of the whole night was that UMBowl achieved a balance where the band and the fans both had the right amount of control and freedom. How Will UMBowl Influence the Next Umphrey’s McGee Album? Continuing our Mannish Boy STLS Energy transfer study, UMBowl also served as an inspiring catalyst for the band as they headed back in to the studio two days after UMBowl on Monday to work on their next album. 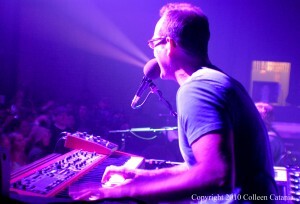 That said, it’s kinda cool to know that Umphrey’s McGee is working on their new album even as I write this post. And I’ll definitely be looking forward to hearing how the UMBowl’s melting pot of interactivity and emotional exchanges will enhance and influence their next album. Were you at UMBowl? What did you feel? What a great event! I was so impressed and the energy in the Lincoln Hall was amazing. Ditto Bobbyluv! It was my first time at Lincoln Hall and I still can’t believe how great it sounded. And I learned some background on the sound system that I will be sharing in a future post.